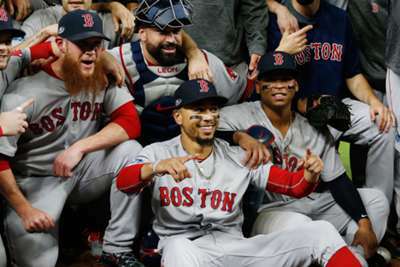 The Boston Red Sox finished with a franchise-record 108 wins this season and dominated the New York Yankees and the Houston Astros on their way to an American League pennant. The only thing standing in the way of their first World Series title since 2013 is the National League champions the Los Angeles Dodgers. This is the best hitting team in baseball against the best pitching team in the National League. And that is the problem for the Dodgers and among our three reasons why the Red Sox will win the World Series. In the 1986 film 'Hoosiers', Rade Butcher tells coach Norman Dale in anger, "We can't win unless we score." It is a simple and obvious statement, but there is no more truer declaration. Teams cannot win unless they score runs and no team in baseball scored more runs, had a better batting average, on-base percentage or on-base plus slugging than the Red Sox. That matters a lot. The team with the better season-long OPS has won each of the last five World Series and eight of the last 11. Boston dismantled the best pitching team MLB has seen in years in the Astros in the ALCS. A good hitting team are of course going to have good numbers, but the Red Sox love to hit finesse pitchers. Boston batted .283 against finesse pitchers with 121 of the team's 208 homers coming against them in 2018. Clayton Kershaw, Rich Hill and Hyun-Jin Ryu are all finesse guys and, while Los Angeles have power arms in their bullpen, Boston not only jump on teams early - the team led MLB in OBP at the top of the lineup - they hit bullpens very well. The Red Sox will almost be guaranteed to hit three of the Dodgers' four starters and the game will only get worse once they get to the bullpen. Dodgers pitchers will have no escape in this series, even when they are in their pitcher-friendly Dodger Stadium. As good as Boston are at home - with the best home record in MLB at 57-24 - there is little drop-off on the road as the team went 51-30 away from Fenway Park. The Red Sox had similar numbers at the plate at home as they did on the road. In fact, they hit more home runs and posted a better slugging percentage away from Fenway. Red Sox pitching is also incredibly consistent as they posted almost identical numbers at home as on the road. Boston see no drop-off wherever they play. Los Angeles will get no respite from heading back to California after Game 2.